Hi ladies! 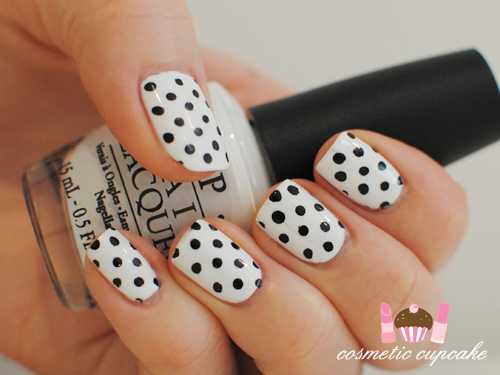 Today I have an inspired black and white polka dot manicure for you. 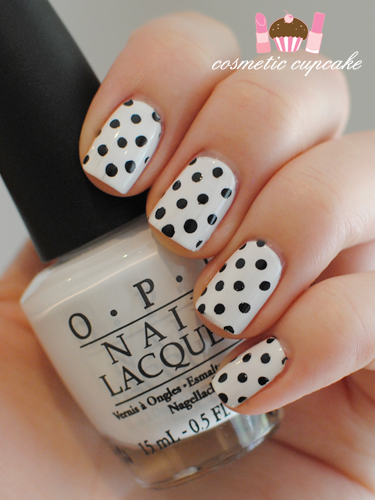 I LURVE polka dots as seen by my incorporation of polka dots in so many of my manis! I was inspired by my black and white polka Zara skirt and my new iPhone case which is similar (you can see it in my HK haul post). I got soooooo many comments and questions on this mani from workmates and patients it wasn't funny! I used 3 coats of OPI Alpine Snow and stamped full polka dot image from Konad plate m79 using Konad Special polish in black. Some of the dots didn't turn out well so I went back over them not so neatly with a dotting tool. ´Chelle, adorable mani! Itá daring and classic at the same time. I love the dots. Here in Rio, we´re using black and white a lot this summer. Have you ever tried english mani (white on the surface and black on the tips)? It´s awesome! Thank you Patricia!! There's just something very chic about black and white. 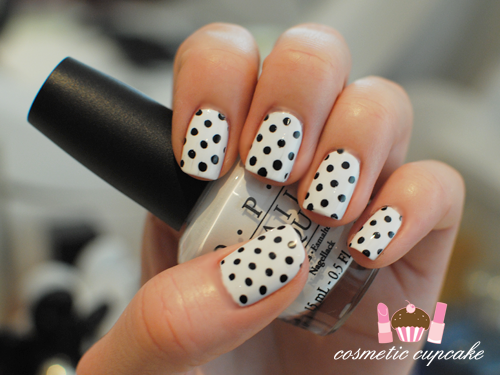 Although the polka dots makes it a bit fun ;) No I haven't tried that one yet! Woohoo we both have fab taste!!! =D I wish it came in other colours too! ooo very nice!!! looks perfect!! Very cool and retro looking! Love it! so chic and classic! love this. Awwww you're so sweet Angie!! It's all down to practise seriously. I change my polish so often! LOL thanks!! I love polka dots but I can see why it would be boring to some. It's all the same! Wow. 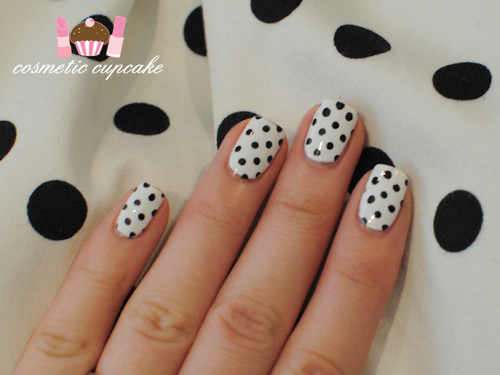 These polka dots are super cute. Fun and flirty. hooooo is super cute !!! When I'm in a rush I use Konad plate m79 to do the polka dots ;) It makes life a lot easier! OMG I love it. Super cute!!! Love it *____* i really need to come back to your blog for some mani inspirations!! So simple, but so cute! I love how simple this! love polka too! looks great! btw. can't believe you used up an entire OPI Alpine Snow so far xD!!!!! Very pretty !!!! I Like your nails !